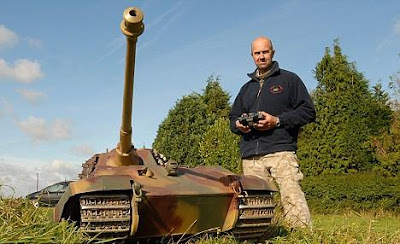 It's the ultimate boys' toy for Christmas - a giant radio-controlled tank that's so powerful it can actually pull a car. The 6ft long monster is a 1/4 scale model of a King Tiger, the German weapon which wreaked havoc among allied tanks during World War Two. Weighing a whopping 250kg, the camouflaged tank has a fully working turret and a 2ft long gun with a realistic recoil action. And speakers are fitted inside to simulate the tank's distinctive rumbling noise. The tank is powered by two, 500 watt 24 volt motors which are so powerful that it can pull a car on a level surface. The tank is the meanest machine available at Mark 1 Tanks, based in Easton, near Winchester, Hampshire. And it holds the title of being the biggest radio controlled tank available in the world. With all the options fitted the tank costs almost £10,000 but smaller versions are available for as little as £100. Other models of tank are also available including the famous World War Two Sherman, the German Tiger 1 and the Russian T34. 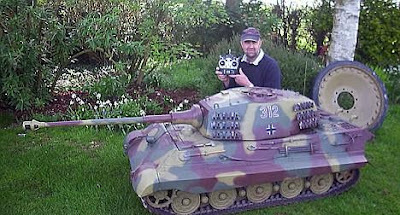 Company founder Mark Spencer said he began building the tanks himself after buying a less detailed version from a seller in Russia. He said: 'It looked a bit like a cheap toy from a toy shop but when I got it working it was fantastic and I thought, "I wonder if anyone else would like one of these." 'I love history but in particular I love tanks - I think it's a lad thing. 'I sell to a really niche market but I think the people who buy the tanks are simply looking for the coolest toy they can find. The larger tanks in the range are all put together by Mark himself in his warehouse with only the smaller, 1/35 scale models coming in 'kit' form. He said: 'Some parts are made in Russia and the motors are made in China but they all come to me here and I put the tanks together. 'It can take me two days or it can take two hours to build one. 'The larger tanks are made from one inch thick fibreglass but all the mechanical parts are metal. 'We have more than 20 models but my favourite is the German King Tiger - I think it's also our most popular model. The basic 1/4 scale King Tiger costs from £6,600 but can get up to almost £10,000 with extras such as the rotating turret, the gun elevation and the speakers. A 1/6 version costs 3,600 pounds while a kit to build your own 1/35 scale tank costs 100 pounds. A 1/6 scale American Sherman tank with a British Firefly gun costs £3,600. The very heavy armour and powerful long-range gun gave the 69 ton King Tiger the advantage against virtually all opposing Allied and Soviet tanks. This was especially true on the Western Front, where the British and US forces had almost no heavy tanks with which to oppose it. The popular American Sherman was unable to penetrate its seven-inch-thick armour even at point blank range.